The Historic St Francis de Sales Church in Devonport. 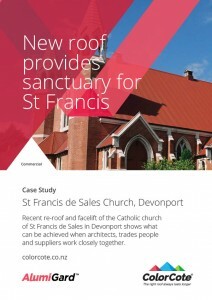 Mixing modern materials with historic architecture can be a recipe for renovation disaster, but the recent re-roof and facelift of the Catholic church of St Francis de Sales in Devonport shows what can be achieved when architects, trades people and suppliers work closely together. The red-brick Gothic-revival style church occupies a prominent position on the slopes of Mt Victoria at the entrance to Devonport village. Although built of sturdy materials in 1918, the somewhat hostile marine environment of the seaside suburb had taken a toll on the brickwork and corrugated iron roof – itself a replacement shipped out from England for the original tiled roof more than 50 years earlier. Phillip Hartley, Building Conservation Surveyor from Salmond Reed Architects Ltd, Devonport, was contracted to design and project-manage the repairs and maintenance.